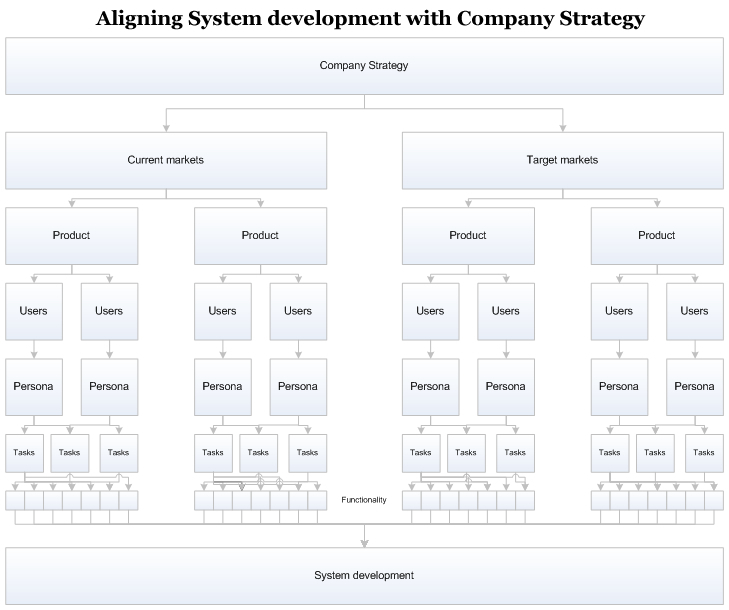 For several months now I’ve wanted to find a way to directly tie in our software development in with the company strategy. I don’t want us to waste time designing and building functionality that doesn’t help the company go in the direction we want to take it. At the same time I’m keen to make sure that we continue to instill an ethos that makes sure that we place our user’s needs and wants at the heart of everything we do. I believe strongly in the merits of User Centered Design. But until now, I have struggled to explain this to people, I haven’t been able to visualise how we could tie up the design, user’s needs and wants, and the company strategy so they all aligned to guide us on our journey. That was until last week. Last week the diagram below popped into my head. It shows how the overall company strategy should dictate all other decisions, most directly; which markets we currently operate in and which markets we’d like to target. These markets, in turn, influence what products we should be offering and where. These products have real users who need / want them and they in turn are represented by Personas (there are too many individual users to design for each one separately). Each persona has a set of goals and tasks that they want to be able to achieve / complete using our products and each of these goals and tasks can be broken down into actual chunks of functionality. These chunks are then those that get scoped up, designed and built into our products and systems. This works because unless we can justify someone’s idea for a piece of development using a persona, which has been created to represent users of a product that is in line with the companies strategy, we will not develop it.